Kilsyth Rangers suffered a disappointing, if not wholly unexpected, Scottish Junior Cup exit at the hands of Hurlford United at Duncansfield on Saturday. The Premier Division leaders were just too strong, winning 3-1, and an upset never really looked to be on the cards. It was a good showing though by Rangers; they were certainly not disgraced and perhaps with a little luck might have taken the game to a replay. There was a fairly even start, although Hurlford showed how dangerous they could be with a couple of eerly corners from which there were good chances made. The opener eventually came in 19 minutes when indecision in the Rangers defence let Ryan Caddis in to shoot past David Tait. Rangers responded with some good attacking play and Phil Dolan was posing a few problems and had a couple of decent shots on goal. There was not a lot really between the sides at this point but approaching the interval Paul McKenzie, who had picked up an early booking, added a second goal with a great header from a defence splitting cross. 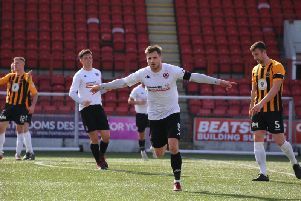 All was not lost just yet though for Kilsyth, within two minutes Salim Kouider-Aissa got his 21st goal of the season with a fine shot on the turn from the edge of the box. A short sharp shower just after half-time sent most of the spectators into cover but it soon passed and with it came a third goal for Hurlford, Ross Robertson scoring from another good cross ball. Shortly afterwards Rangers were down to 10 men when Scott Upton was red carded, having already been booked in the first half. Hurlford were now well in control of the game and although they had plenty of possession could not add to their score. Franny Kelly had a great chance to pull one back for Rangers but slipped in the box, although he did recover to get a shot in. A late flurry by Rangers did produce several good openings but the shots were not quite what were needed to produce a shock and Hurlford went on to be deserved winners and go through to the last 16,, leaving Rangers to concentrate their efforts to achieve a promotion place.